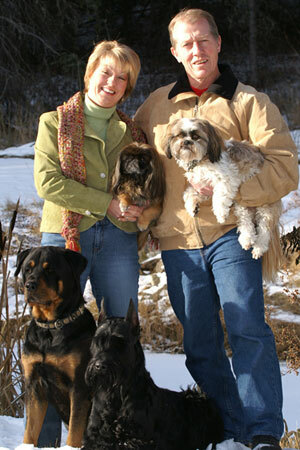 We are Kim & Harry Zippel, and every day of our life is full of fun from a four-legged friend. Dogs and cats are a big part of our day, every day. 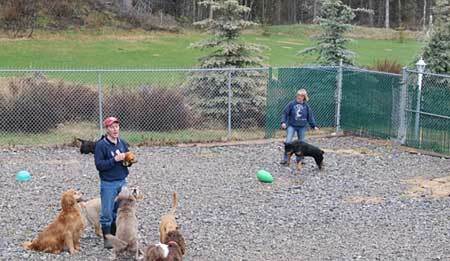 Dogs are our passion and have been since Kim began training in 1986, kicking off a life-long career focused on dogs. Our home is filled with our own pets and our life is filled with yours! We promise to care for your pets with individual attention and a healthy environment. Kim’s love of dogs began in 1986 when she went to her first obedience class with her Siberian Husky. After learning a lot more about training and different dog breeds, she acquired her first Rottweiler in 1987. “Willya” introduced her to the competitive obedience ring, the conformation ring, the schutzhund field and tracking field. 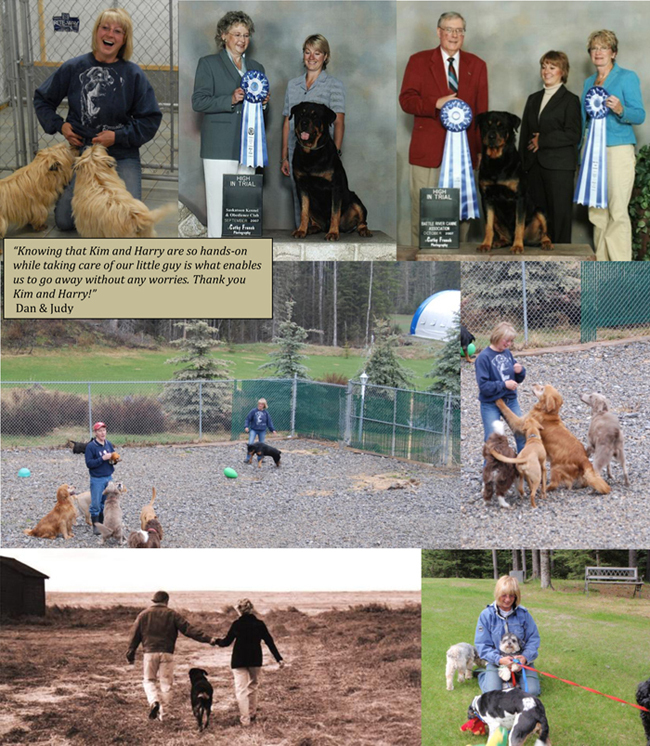 In 1991 Kim and Willya earned the number one Rottweiler in obedience and number two Working Dog in Canada. 1989-1997 Kim opened Booshay's Training Academy, a full time training centre which included Calgary's first Doggy Daycare. Kim also ran a full time grooming shop and obedience school. In 1997, Kim acquired Especially For Pets, a small pet supply store in Calgary. This neighbourhood pet retail store developed into an all round pet centre which included a full time grooming shop, a doggy day care and obedience school with Kim as sole instructor. Harry joined Kim professionally at Especially Pets in 2005. Together they decided that the little kennel just south of Bragg Creek was the place to be!! In 2008 they purchased Blue Caleb Kennels and renamed it Blue Ribbon to signify all of the blue ribbons Kim has won with her dogs at obedience trials. They want you to know that they will give "their best" attention to all of the great dogs that come and stay. From rescue dogs to show dogs to competitive obedience or field trial dogs, we will ensure they have a comfortable and fun stay with us. Blue Ribbon signifies "the best" and that is how we feel about our kennel.